After WW2, there was a real shortage of new vehicles. They all had to be exported so that Great Britain could repay its massive war debt to the USA. Hardy Brits had to take the bus to work, or use their bicycles. If you’d purchased one of these Berini cycle-attachment engines when they came onto the British market in the early fifties, a trusty steed such as this 1949 Raleigh Sports Tourist Gent’s Roadster would have been an ideal mount. 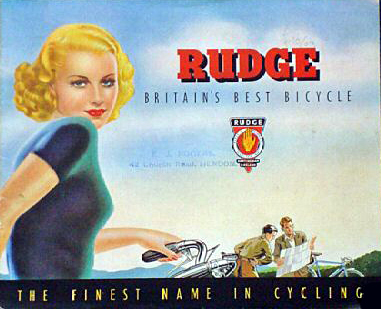 The Rudge had an excellent reputation for craftsmanship, at a time when Great Britain’s bicycles were still the best in the world. The Berini is not too heavy on the front forks, as the engine is reasonably light and well-balanced in its fitting, and the bike is substantial enough to carry it. As you can see, it’s a very elegant mating of power unit and machine. The Rudge Berini has been through our workshops and, as it’s taxed and MOT’d, it’s ready to jump on and ride. This Berini has been fitted with an external coil. It’s housed in the box on the back, along with a (new) 6v battery. You must switch the ignition on before starting it. The Berini M13 was built in Rotterdam from 1949 to 1961. As it was developed from the Cyclemaster, engine size was initially 26cc, increased to 32cc in 1951 (the M14). In the Netherlands, it was known as “the Egg” because of the shape of the fuel-tank (designed by welding two headlamps together from a DKW motorcycle). The Berini was the most popular Dutch bicycle engine and could reach up to 30 km/h. Affectionately known as the ‘Little Egg’ Berini was one of the top Dutch cyclemotor manufacturers. As well as this very popular model, the company also sold Cyclemasters under license for the Dutch market. The Berini M13 is a very well-made machine. It was exported to great Britain, and received good reports in the motoring press of the day. The Rudge was a very well-built bicycle in its day. This particular example certainly reflects that quality, being in such excellent original condition over 60 years after its manufacture. The cash price for the Deluxe Sports Tourist in 1949 was £21 14/- 5d.